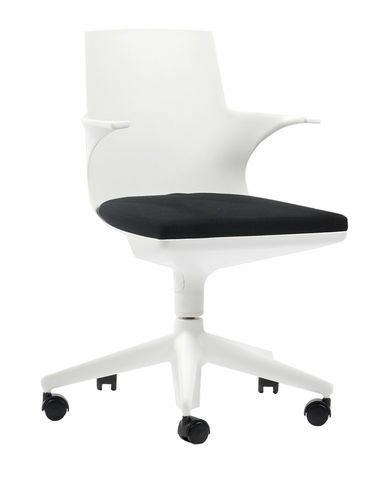 As a light office, unitized chair on wheels, the Spoon Chair's technology is absolutely innovative. In fact, the special injection-moulded bi-component technology used creates a "layered" product. The easy-to-use handle that regulates the mechanism is integrated and perfectly concealed in the lower trunk, so as not to break the clean line of the chair. A clean, realist designer with a focus on method over style, Antonio Citterio is considered one of the best Italian designers of all time. Oriented towards the pragmatism of the object rather than the hype surrounding its design, Citterio was interested in the productive, technical and socio-economical, rather than solely aesthetic aspects of the product. However, thanks to his complex design and production process, Cittero still became the creator of a range of best-selling items that anticipated, as well as supported, the tastes of his audience. Maximum efficiency; clean yet non-minimalist lines; understated, yet never strict, geometric shapes; and materials that are exactly as meets the eye, void of expression. This is the stylistic hallmark produced by the work of Antonio Citterio, not the other way round. This hallmark is reflected by the Kelvin LED lamp from Flos, and all Cittero’s other projects signed by the likes of Artemide, B&B Italia, Kartell and Vitra, all centered around technology and the sensitivity of this extraordinary designer.